Nation of Islam leader Louis Farrakhan delivered a eulogy for Nipsey Hussle at the slain rapper's star-studded Staples Center memorial service Thursday. Hussle, born Ermias Joseph Asghedom, wasn't known to be a member of the Nation of Islam, but shared Farrakhan's enthusiasm for uniting and empowering African-Americans and other dispossessed groups, especially on the issue of gang violence. "I never knew him like you knew him," Farrakhan said. "But I know him because he comes from God to make a statement in this world that will live into the next world." 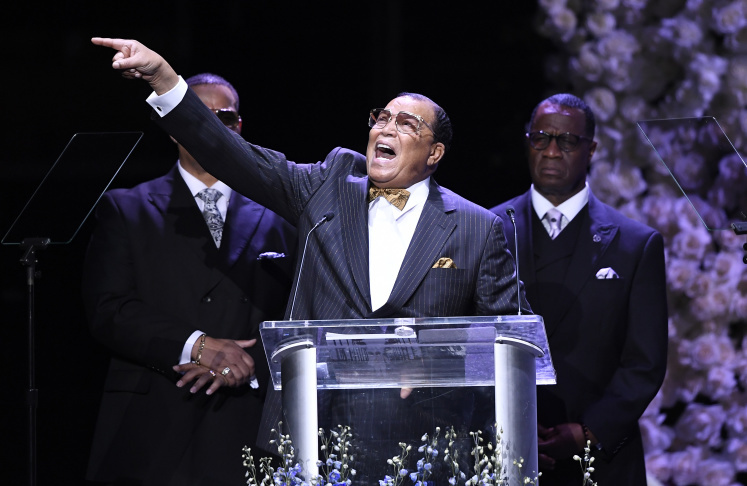 It was an impassioned moment in the spotlight for Farrakhan, a controversial and complicated figure who rose to fame as the leader of the Nation of Islam in the late 1970s, after former leader Elijah Muhammad died and the group splintered. In the 1950s and 1960s, Farrakhan was a close associate of Malcolm X. He's perhaps best known for organizing the 1995 One Million Man March on Washington, D.C., encouraging black men to unite — and vote. The Nation of Islam, which played a significant role in security along Hussle's procession route Thursday, has been rejected by mainstream Muslims and designated as a black nationalist hate group by the Southern Poverty Law Center. 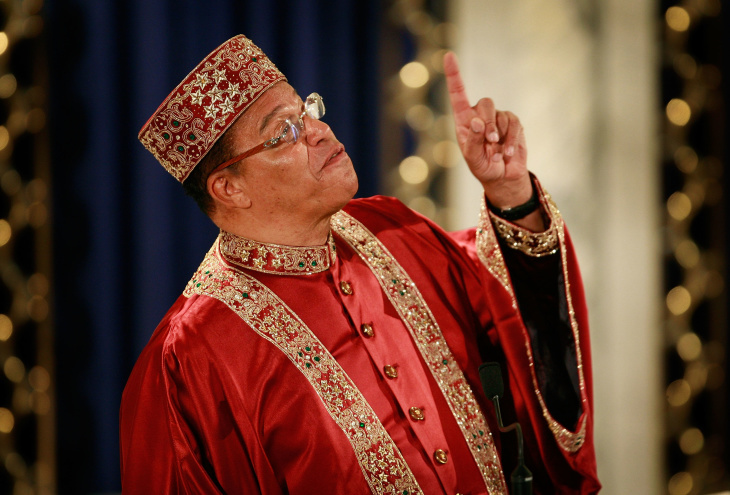 Farrakhan is consistently accused of anti-Semitic and anti-LGBT rhetoric, a fact that recently divided activists in the Women's March movement. During the 2008 Democratic presidential primary, Hillary Clinton called on Barack Obama to denounce Farrakhan's anti-Semitic remarks during a televised debate, which he did. Stephen Finley, a professor of religious and African-American studies at Louisiana State University, said despite all this, featuring Farrakhan at the memorial was a logical choice. "There's been an intimate relationship with Nation of Islam and hip-hop culture, especially on the west coast," Finley said. Farrakhan and his religious movement have a history of closeness with black artists like Hussle, the son of an Eritrean immigrant and an African-American mother, who often spoke about colonization and black liberation, and referenced it in his music. "Those folks have always been influenced. Everyone from Ice Cube to Paris to MC Ren. In the '90s, even Michael Jackson claimed to have joined the Nation," Finley said. On stage, Farrakhan stood beside Minister Tony Muhammad, a Nation of Islam member who first met Nipsey Hussle in 2005, when the religious group had an altercation with LAPD in Hussle's neighborhood. Muhammad and Hussle reunited at a peace rally at Crenshaw High School in 2014. Farrakhan called Hussle "the prophetic voice of his community" and "a prophetic soul who is to hip-hop and rap what Bob Marley was to reggae." To all of us who are here, who come to pay our respect to this prophetic soul who is to hip hop and rap what Bob Marley was to reggae he is the prophetic voice of all in that community. What do I mean by that? He lived the gang life but he didn't stay there. He lived the life of the hood but he rose above the pull of gravity. Farrakhan, 85, has long been influential in gang intervention efforts around the country. He was a key supporter of a 1992 gang truce in Watts. In 2016, he backed an anti-gang violence event hosted by Compton rapper The Game. 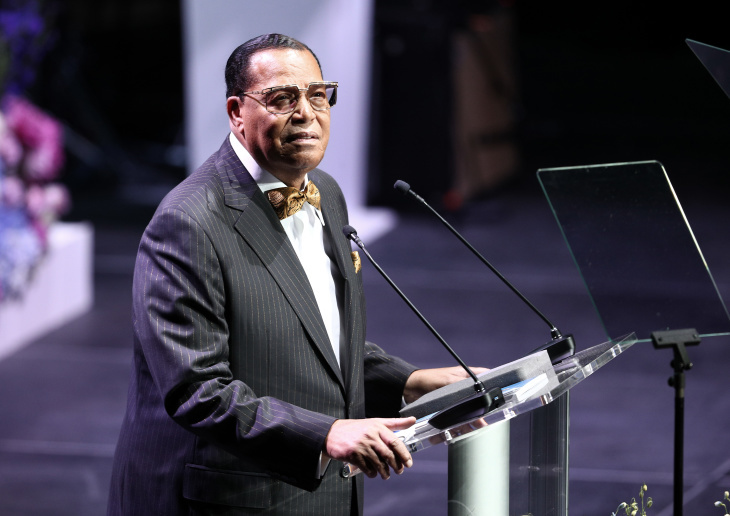 "Farrakhan has always been there to try to broker peace between black communities that have been at odds with each other, gangs, and so on," Finley said. "Who else can bring gangs together like Farrakhan can?" That's something the two men shared. When he was young, Hussle was affiliated with the Rollin 60's Crips. But later in life, the hip-hop artist and businessman invested heavily in the Crenshaw neighborhood where he lived, and often spoke about unity between rival gangs in South L.A. The day before his murder, Hussle was scheduled to meet with the Los Angeles Police Department to discuss programs for underserved children and gang prevention. Before the 2016 election, Hussle teamed up with Compton rapper YG, who is known for his affiliation with the Bloods gang, on the anti-Trump track "FDT." "He lived the gang life, but he didn't stay there," Farrakhan said of Hussle, during a 13-minute stadium address. "He lived the life of the hood, but he rose above the pull of gravity." It's a great honor for me to be here to honor a life that will become more famous in death than in life. The work his life will produce will go down in history as something that changed the world. The name Ermias in Eritrean means 'God is rising. 'The name Nipsey in that same language means homie, a brother from the hood. He never really left the hood but now the whole world will embrace him as his life and his death changes the hood and produces a profound change in the world. 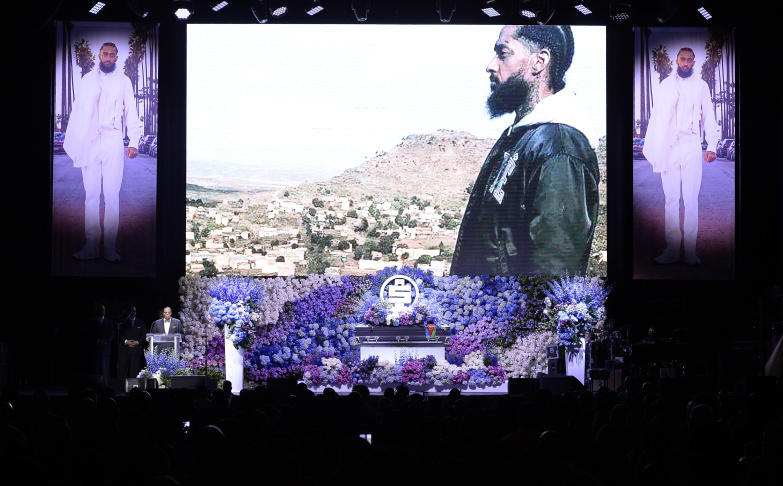 In his closing remarks, Farrakhan urged the crowd to allow Nipsey Hussle's memorial to be "a call for us to get up from where we are and be a new man and a new woman...and take on the knowledge that we may fly like he flew above the condition of the hood and above the condition of the world." So when we celebrate Nipsey, we must celebrate unity. If we in the name of Nipsey - in the name of Ermias - decide today at this memorial for him, that his homegoing will be a life call for us to get up from where we are and be a new man and a new woman and take the mark of the beast out of our hands and out of our head and take on knowledge that we may fly like he flew above the condition of the hood and above the condition of the world. Earlier this week, members of the Nation of Islam dressed in full regalia honored Hussle with a tribute in the parking lot of his South L.A. clothing store. On Thursday, the religious sect provided security along Hussle's 25-mile procession route through the city. "Even during all of this, when it comes to crowd control and order, it's the Nation of Islam that does it in a way that's both respectful to the community and in a way that the community respects," said Melina Abdullah, a professor of Pan-African Studies at Cal State LA.